Resilience, the latest urban policy and think tank buzzword extolled upon the world's urban dwellers, operates as an insidious alias to dispossession and territorial stigmatisation. Yesterday morning (27th January 2014) I noticed a few tweets announcing the Guardian’s new “Cities” section. The newspaper has a track record of publishing excellent short essays addressing urban issues, especially in its “Comment is Free” section, so I confess to initial interest and perhaps even mild excitement. Then I read two of the introductory pitches by the editorial team, delivered with an intention to “start the debate”. Amidst the bilious drivel (I think a ‘community cooking collective’ is best understood as a ‘Big Society’ dystopia), a few buzzwords stood out: “smart city app”, “old-quarter renovation”, “cycle paths”. The steer is towards a particular vision, that of the gentrifying city embraced by policy elites enamoured with pseudo-intellectuals like Richard Florida, Leo Hollis, Andres Duany and Ed Glaeser, but universally panned by any urbanist with a sense of social justice and an ounce of theoretical awareness. A few tweeters began to smell a rat, but Rich Goulding produced my favourite: “Tell us about the most innovative synergistic initiative unleashing quality of life in your shanty town”. Already more widely across the website, and propping up the gentrified quaintness being embraced, were uncritical nods towards the urbanism of Jane Jacobs, whose defeat of New York City’s master planners is these days romanticised as a humanising vision for cities without any acknowledgement of the disruptive and cookie-cutter gentrification that such a vision has unleashed all over the world. A poster in New Orleans, blogged here. Less surprising still, but more concerning, is the realisation that ‘resilience’ is guiding this entire Guardian ‘Cities’ initiative. It is sponsored by The Rockefeller Foundation, which has devoted extraordinary resources to a research programme entitled “100 Resilient Cities”, effectively a neoliberal competition that awards grants to the 100 cities that it feels "have demonstrated a dedicated commitment to building their own capacities to prepare for, withstand, and bounce back rapidly from shocks and stresses". In other words, prizes to the cities that rack up points in respect of getting back to the desired status quo of capital accumulation and elite wealth capture as quickly as possible. That there is a strong desire among urban managers to compete is evident in the fact that more than 1000 cities registered to take part in this programme, and almost 400 formally applied for inclusion. Like its ideological twin of ‘sustainable urbanism’ before it, 'resilient cities’ is proving extraordinarily seductive. In the UK it is currently being embraced and pushed by deeply conservative ‘good-design-can-save-us’ organisations such as The Prince’s Foundation for Building Community and Create Streets. These are effectively large landowner lobbies that are pushing a profoundly conservative vision of cities. Staffed by bourgeois architects, planners and self-styled ‘urban gurus’, all of whom have started using appeals to environmental terms like ‘resilience’ to bolster their long-held fanatical devotion to the sinister American cult of ‘new urbanism’, they advance a darkly troubling vision of urban planning that purports to be about recreating ‘traditional’ streets and pedestrian-friendly ‘mixed-income’ communities. In reality, they advocate the creation of self-absorbed, clap-happy zones proudly celebrating how handpicked social housing tenants – a minority - are hidden behind a sterile vernacular of Quality Street, neo-Georgian facades. Those behind the scenes, extracting value from the hysterical panic of a ‘housing shortage’ whilst ignoring the existence of nearly 1 million empty homes in the UK, call themselves ‘placemakers’ without the least hint of irony or even squeamishness. 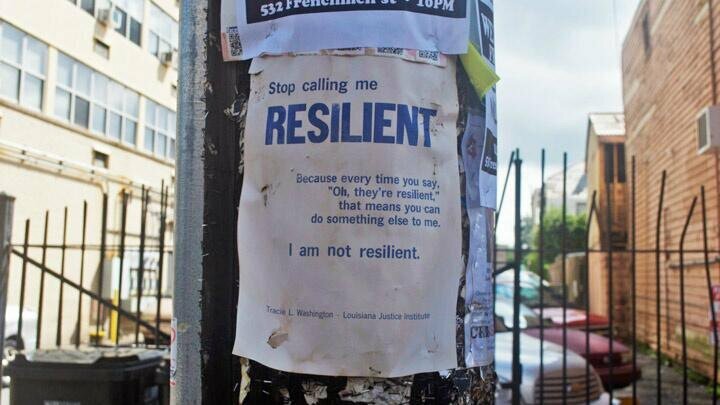 Resilience so easily supports not only austerity, but the territorial stigmatisation that so often precedes strategies of dislocation (“that community is just not resilient enough, so we need to break it up and scatter its residents”). Since the famous and hugely influential writings of the Chicago School of Human Ecology, there is a long and ugly history of concepts being brought from biological sciences to be applied to the social sciences and especially the study of cities – “regeneration” being the most pervasive recent example. In the case of resilience, a global recession morphs from being a political creation into a naturally occurring phenomenon that requires a program of public expenditure gutting to set it back on its natural path. As an analytic framework (if it can even be called that) “resilience” studiously, perhaps even judiciously, ignores every important question about the contradictions of capital accumulation and circulation, about uneven development, about enabling political structures, about state strategies of ‘growth machine’ branding – I could go on. What we will not learn from the Guardian ‘Cities’ feature it is that when the shadowy urban ‘experts’ talk of “resilient cities”, there is a symptomatic silence over the most resilient feature of cities all over the world: what David Harvey calls “accumulation by dispossession”, or the relentless quest for profit from land and real estate, usually achieved via violent land grab and forced eviction. Indeed, a frequent past contributor to The Guardian, Saskia Sassen, has a book forthcoming analysing this phenomenon, entitled “Expulsions”. While in 2009, the Centre on Housing Rights and Evictions produced a devastating report in the wake of a global analysis of forced eviction, and concluded that it “ranks amongst the most widespread human rights violations in the world.” Attention should surely be towards the diminishing ability of people to stay put in cities, given the potential ground rent to be extracted from the land they occupy. Neoliberal urbanism has proved to be extraordinarily resilient, and the most “resilient community” of all appears to be that of a cartel of politicians and financial executives, aided by think tanks and philanthropic organisations, who have “bounced back” (to take the language used in the Guardian) from a crisis they created with even more violence and venom towards marginalised citizens (who they treat as the culprits). There are scholars and activists all over the world charting and challenging these developments, and also researching the social movements and class struggles erupting from Athens to Istanbul to Buenos Aires to Cape Town. But these scholars are very poorly represented, if at all, among the “best urban voices” and “best city blogs” on Twitter currently collected by Guardian Cities editorial team. This very disappointing series is nothing more or less than a pure exemplar of vested-interest urbanism. Given the sponsor, it is impossible to be convinced by Oliver Wainwright’s plea that the series is critical and all about “peeling back the glossy veneer” of buzzwords and ‘big data’ visualisations. Approach with extreme caution. We are not resilient. For more articles on the series, go to the Cities in Conflict main page.